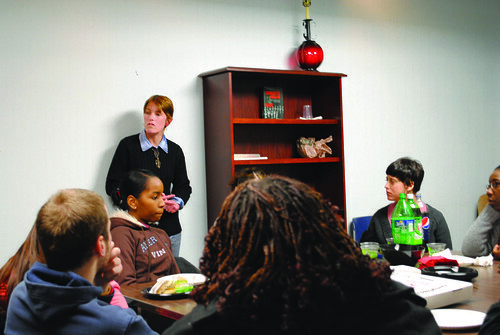 JOSHUA FERNANDEZ TTN Professor Mary Stricker speaks during a meet and greet for her urban violence special topics course. During the university’s winter recess, Gladfelter Hall’s seventh floor saw students return early to the quiet classrooms. In a small meeting room, sociology Professor Mary Stricker and 30 of her students gathered around a dark brown wooden table to discuss a new sociology special topics course, Urban Violence – A Critical Look at the Institution. The pilot urban violence course is unlike others at Temple. It was created after a campaign by the Student Peace Alliance related to an independent study for SPA Vice President Max Cuddy, a senior sociology and African-American studies major. Cuddy, backed by his organization and Stricker, organized the course so that in addition to the Temple students, 15 high school students could take the college class. SPA came up with the idea for the class and began campaigning for it to begin during the 2008-2009 academic year. The group researched ideas and topics before finally voting and deciding on urban violence. “We want to explore the causes of violence, what it is and how we think of it in an urban context,” Cuddy said, adding that SPA members wanted to know the history of violence and explore it through themes such as gangs, drugs, gun control, masculinity, family issues and incarceration. Stricker said the course will begin with the history portion, not just in Philadelphia, but elsewhere. Philadelphia will be a focus, she said. Once they established course objectives, SPA members proposed the idea to the General Education curriculum heads before pitching it to the head of the Sociology Department. From there, it was a matter of finding someone to help develop and teach the course. The group met Stricker when she aided with course development, and after what she described as persistence by Cuddy, she agreed to teach it too. “This is [SPA’s] vision. It’s their course,” Stricker said. “They created it as best as they could from start to finish, and I came in and made revisions as I saw fit. “Max has worked very hard on helping me design the syllabus, come up with readings, themes for the course, et cetera. The Peace Alliance’s stamp is on this syllabus. It will be a big stamp on this entire course, equally with mine,” she added. One of the three high schools involved in the special topics sociology course was misspelled. The Philadelphia school, “YouthBuild Charter School” is an academic and service learning process charter school that allows engaged young people who’ve dropped out of high school the chance to earn a high school diploma within a year. Additionally, the University Community Collaborative of Philadelphia (UCCP) was in collaboration with the development of the special topics course’s syllabus, and helped Max Cuddy access and partner with the schools participating in the class. Students from the high schools attended the meeting Jan. 13 and met their professor and college peers. All seemed to be enthusiastic about taking a college-level course on Main Campus. “It’ll be a perfect opportunity to voice my opinion on topics like urban violence,” said Bryan Collins, another senior Youthbill student. Stricker said the high school students will bring perspectives of stopping violence, whereas the Temple students are coming in with perspectives of avoiding it. Cuddy said he and his fellow SPA members are pleased to see this class in the curriculum. Joshua Fernandez can be reached at josh@temple.edu.